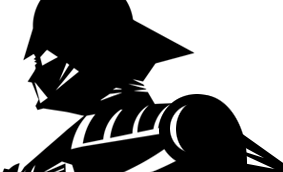 Though the image on every Stormtrooper card back is from the same photo, the Tri-logo version has been touched up to remove the second Stormtrooper in the background. 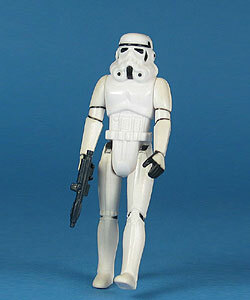 The figure was renamed Imperial Stormtrooper on The Power Of The Force card back. Comments: The vintage Stormtrooper is the exact polar opposite of the modern figure. Whereas this figure is quite accurate to the film version, it is completely void of any form of action posing. On a positive note, with his moulded head, he had no choice but to stay on target? as long as he was facing it directly. Major Variations: Though all vintage figures have minor variations, the only major variation is the hard to come by Japanese Takara version, which, though in a similar stance, is an entirely different sculpt. It is easiest to spot by looking at the head. Also of interest with the Takara version, is the bolt on the figure's back, not unlike any See-Threepio (C-3PO) or Death Star Droid figures. Though similar at a glance, the figure on the left in the photos below is the Luke Skywalker (Imperial Stormtrooper outfit) from 1984.